Hi everyone! Long time no see. I'm really sorry for the long absence! I've been quite busy lately, with real life and other stuff. 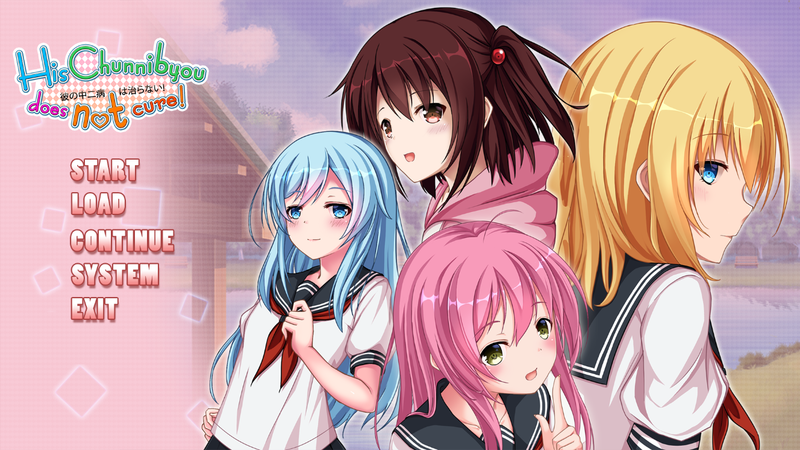 Anyway, I've prepared some visual novel reviews for the next few weeks so... stay tuned, alright? So... I kinda went right into this game without knowing the plot beforehand. The game starts with our main character, Pleione, waking up after a piece of metal struck her home while she was asleep. She goes outside to talk with her sister, Melia, who speculates that the piece of metal may have come from the Moon. Shocked at this new information, Pleione visits Kikkakaya, a lagomorph from Earth who resides with the faeries. 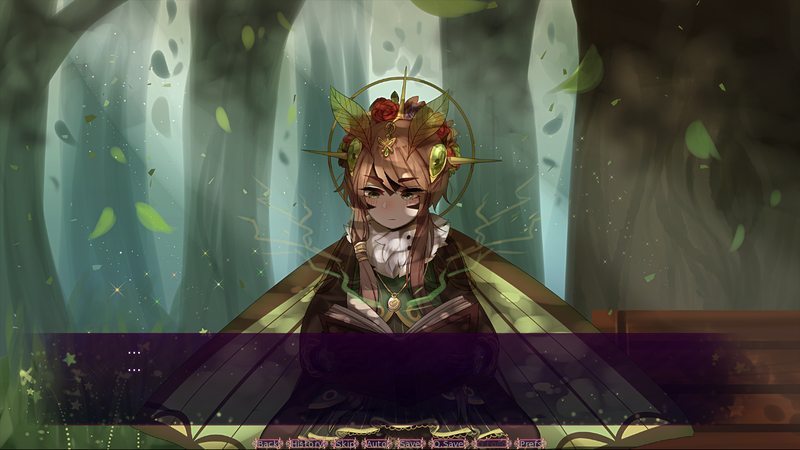 Kikkakaya promises to help Pleione, but for a favor. Pleione then visits another sister, Aetna, who also agrees to help her on one condition. With all these in place, Pleione may finally have the chance to go visit the Moon for herself! All I can say is, it's a cute little story, if a bit forgettable. And I don't mean that in a bad way; all I mean is that not a lot of memorable things happened in the game. There's a hint of GxG romance near the end of the game which made me pretty happy, but that's about it. I'm not gonna judge (harshly) though, since this game is an entry to the NaNoRenO 2017. Sadly, the writing leaves a lot to be desired. The dialogue felt both flat and yet too overly dramatic at times to me. Characterization was also pretty minimal, as there wasn't much difference between the various characters. 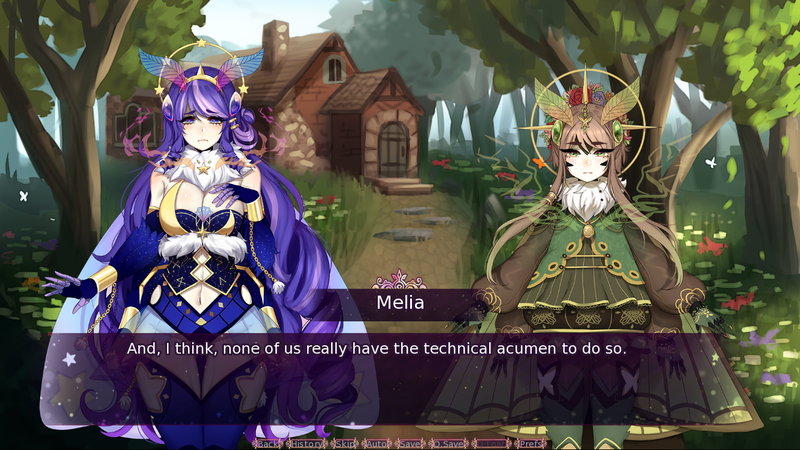 You could change Pleione's name to Melia and Melia to Kikkakaya and I wouldn't even notice, I think. Aside from that, I also didn't like how the story is told from a third-person perspective, but this is more of a personal preference than anything. I have to say it, the art is absolutely phenomenal. I loved everything, from the backgrounds to the character sprites. The level of detail in the individual sprites is almost breathtaking, to be perfectly honest. The backgrounds seem to be made by a different artist, judging by the difference in the art styles. Nevertheless, they are also just as good as the sprites. Also, despite the different art styles, the two blend into each other rather nicely. As for CGs, I didn't see any that look like your traditional visual novel CGs, but there were some that came pretty close. Overall, if I could give an individual strawberry rating for the art, I'd definitely give it nine out of ten. My only gripe is the limited number of expressions per character. I'm not sure how many there are exactly, but they certainly aren't enough to convey the emotions of the characters during specific points in the scenes. The GUI is really cute! I already loved the main menu right from the get-go. But that's mainly because of the GUI art. Isn't it just lovely? As for the font, I think it goes without saying that there are a lot better options out there. 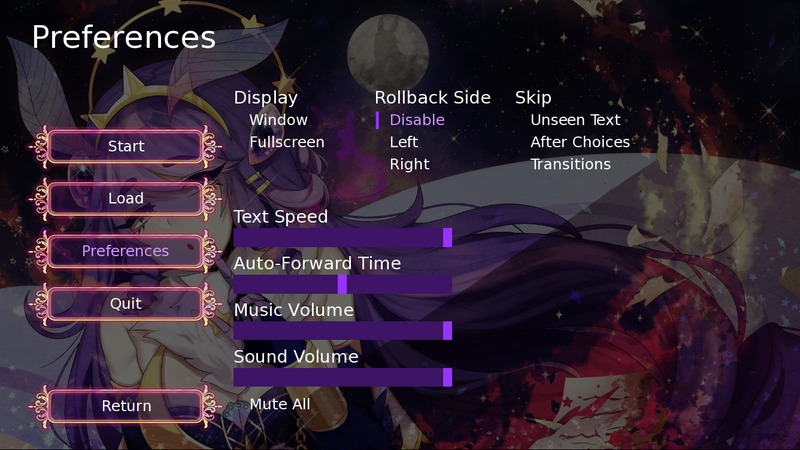 I'm not sure, but it seems to be the default Ren'Py font? I don't know if it's just because I've seen it dozens of times before, but I really don't like seeing this font on newly-released visual novels. I like the music tracks on their own, but there were times when I felt that they weren't exactly suitable for the scene. Since the game is only around 5,500 words, I managed to finish it in under 20 minutes, even as I took notes for this review. Like I said, it's a cute little game, but that's about it. 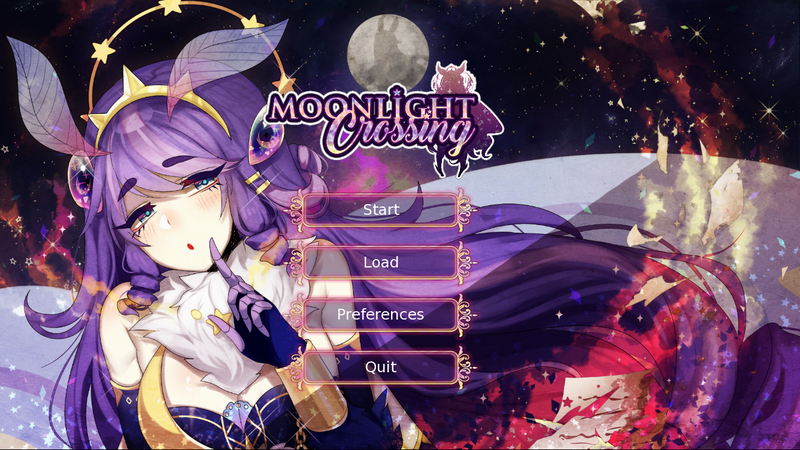 Sadly, despite the spectacular art, Moonlight Crossing is pretty forgettable. The writing is quite bland and the story itself doesn't have a lot of memorable scenes. Nevertheless, I'm looking forward to this team's future projects! Aside from the writing, the game is really quite well-made. I'm sure, if given more time than NaNoRenO's 1-month-deadline, they'd be able to create something ultimately better than this one. 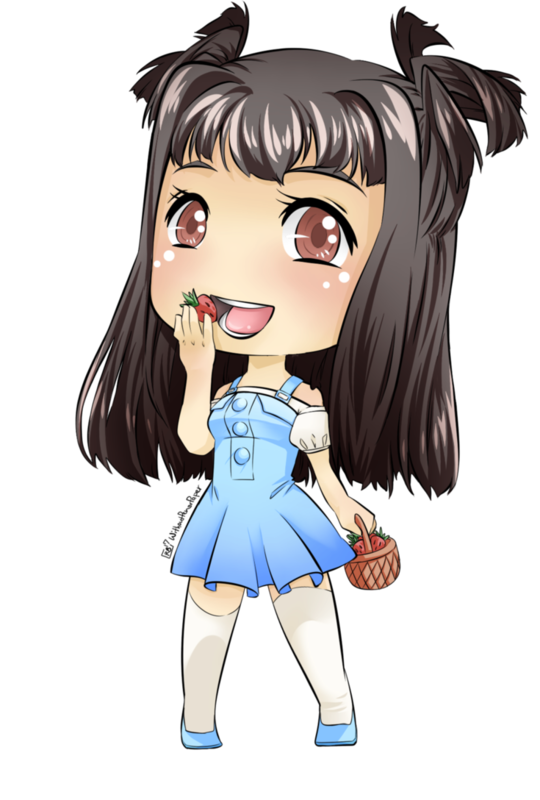 But for this game of theirs, I'd have to give just four strawberries. Even the most amazing art can't salvage a not-so-good story/writing, after all.